In June of 2015, precious Faith, weighing less than two pounds, came into this world earlier than expected. She spent the first three and half months in the NICU in Nashville, Tennessee. When she was discharged, she was still on oxygen and was soon diagnosed with epilepsy and mild Cerebral Palsy. In February 2017, Faith’s parents, Linda and Jacob felt Faith was well enough to travel and moved to Florida for the warmer weather and to be closer to Linda’s family. They were so pleased with how Faith’s health and development improved. She was about ready to be discharged from all the specialists when, in September, 2017, her parents received the devastating news that Faith was diagnosed with Hurler Syndrome and would then need a whole new set of specialists. 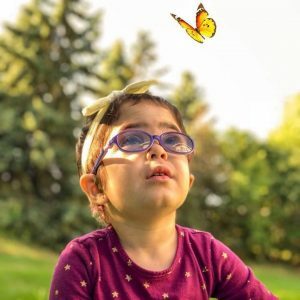 Her parents immediately began research and within a week’s time, sold most of their belongings and left Miami and headed to Minneapolis, Minnesota to have Faith cared for at the University of Minnesota Children’s hospital. Testing indicated that Faith’s gene mutations were very rare and it was difficult for the physicians to make predictions about the severity of Faith’s case. It was unclear if Faith was a classic Hurler or a Hurley-Scheie. By this time, Faith was over the age of two. Finding a donor match provide challenging and their best option was a 5/8 cord blood match. Given all these factors, deciding whether or not to have Faith transplanted was a difficult decision. Ultimately, they went ahead with the transplant and that process began in early 2018. When Faith’s hair began falling out as a result of the chemo, the nurses came to shave her head. This distressed Faith and she began to cry. In a spontaneous loving response, her parents playfully showed Faith there was nothing to fear or be sad about by shaving their own heads. Tears turned to laughter and an unforgettable memory was made. This is just one of many examples how this family has responded to the difficulties they have faced and how they’ve managed to transform the pain and suffering they have faced into redemptive moments. Faith has done well through the transplant process and Linda reports that the outcomes have exceeded everyone’s expectations. The Pathways program provides families with education and comprehensive support throughout the first year of diagnosis. Through innovative ways, we connect members with services, both locally and collectively. We equip and strengthen families to manage care and establish resources needed for the MPS and ML journey.